Description: Capturing an era of style and charm from days gone by, Oyster Bay features a Goblet styled shade in Opal White blown-glass that is perched upon Solid Brass hardware. The fitting, arm and backplate are designed and crafted with the exact details of old world craftsmanship. Custom crafted in in Upstate New York, this American Revival fixture is designed with a handsome Craftsman Brown finish. 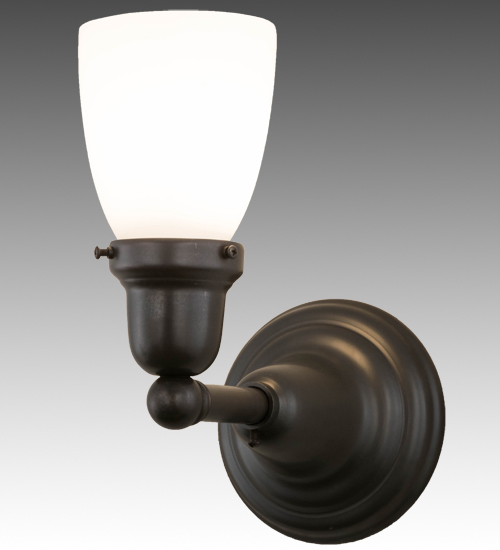 The fixture is ideal for interiors and covered porch lighting applications. Custom sizes, styles and colors are available, as well as dimmable energy efficient lamping options.